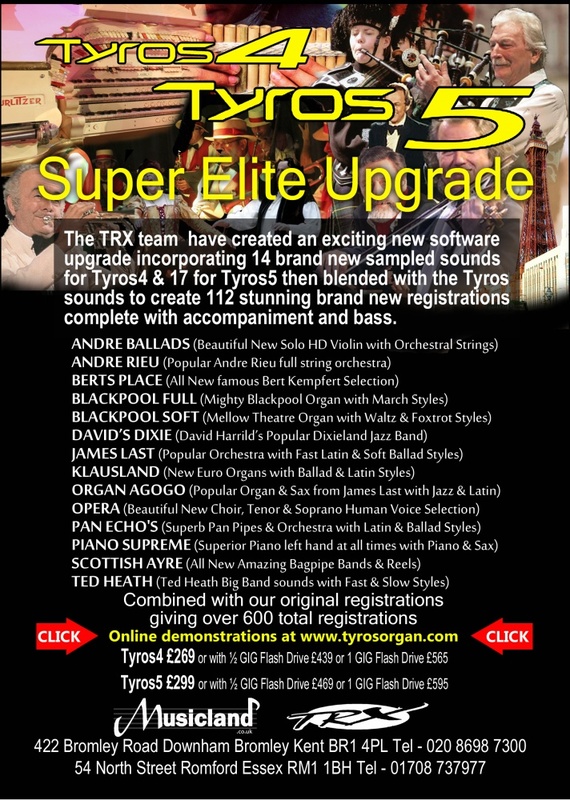 Musicland has created an exciting new software upgrade to the Tyros-5 incorporating 17 brand new sampled sounds then blended with the Tyros-5 sounds to create 112 stunning brand new registrations complete with accompaniment and bass all bundled with our existing software giving a total of over 600 registrations. Disclaimer: Due to the nature of software being a copy-able product, refunds and returns will not be accepted unless the software is faulty; In which case the software will be exchanged. TED HEATH (Ted Heath Big Band sounds with Fast & Slow. All our latest software covers every configuration including Single Keyboard, Single Keyboard with Pedals and Twin Keyboard systems with or without pedals. We at Musicland are dedicated to software development to bring you new and exciting sounds/registrations for your Tyros4 or Tyros5 bringing a whole new dimension to your music.